In England children sit tests in maths and reading at the end of Key Stage 1, which is when they are likely to be 7. Whatever we might all individually feel about testing at this age, if testing is going to happen it must be done rigorously well. It should not set children up to fail. It should not allow them to fail through sloppy exam design. It should not model bad practice. This year's SAT in reading fails. 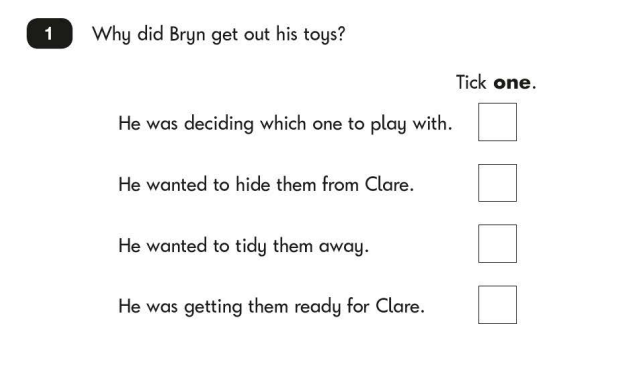 The reading test asks the child to read two pieces of text and answer questions on them. One piece is a story — or at least a fictional narrative. The other piece is non-fiction. I am happy to see fiction and non-fiction given equal status. After all, the child's entire school career will depend on being able to extract appropriate and accurate information from non-fiction texts. A good start. The story is (inevitably) anodyne and dull. Not the sort of thing to inspire children. But, letting that go. Let's see how well we can do with a reading/comprehension test for 7-year-olds. Should be easy enough, no? Seems fairly clear: he's excited. He wasn't any of these. He was excited. I guess we are supposed to think happy=excited. That's not going to sit well with teaching children that words have distinct meanings and nuance. So now he is nervous. He is excited to meet his cousin, and that makes him nervous. It doesn't make him happy. 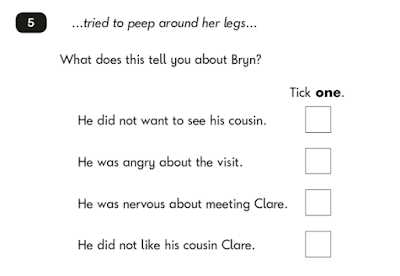 If we read the whole story and chose 'worried' in the first question, we'd lose a mark—even though there is nothing to suggest that Bryn was 'happy'. Let's look at the story. It doesn't model good writing. Bryn has got his toys out (so they were put away previously) and his dad says he's pleased to see him tidying up? How does his room look better with things lined up on the floor? This doesn't make sense. Is it a joke, indicating his dad doesn't know what his room looked like before? Isn't that rather an unfair thing to put in an exam, when the kids will be anxious anyway? Or is it there just to trick the kids so that they answer this question wrongly? And what about that second sentence? "He decided Clare could choose first which to play with, although he couldn't help hoping it wouldn't be the big blue one." This should be two sentences. Why is there a double negative? These kids are 7! "Clare could choose first which" is not an easy construction. Well. 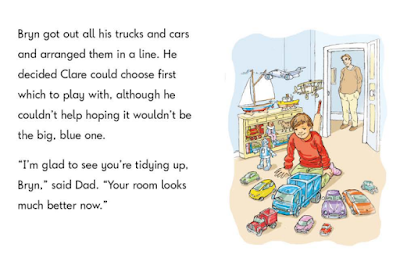 Whatever happened to the toys-will-be-toys campaign and its books counterpart? All that effort we are putting into telling children that there is No Such Thing As A Book For Girls or a Book For Boys. Thank you, HM Government for undermining that one. 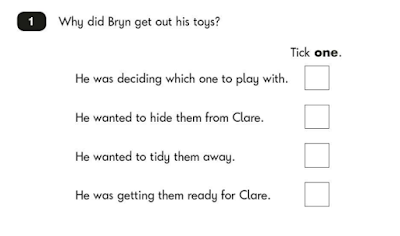 There is, sadly, not an opportunity to point out that Bryn has been brainwashed by narrow-minded gender stereotyping (that is not compensated for by his mother driving a tractor). I won't go through the second text, but will just say that it starts with the ill-informed sentence "Do you take a lunchbox to school with you?" All KS 1 children in state schools in England are provided with free school meals. They don't generally take lunchboxes. Some schools don't allow them to take lunchboxes. Perhaps the examiners' children go to private schools? Perhaps the examiners never set foot in a primary school? Perhaps, if we are going to test these young children, we should test the tests first. *All exam text and images are Crown copyright and reproduced here within the terms of the Open Government Licence. We have tests here along the same lines, in Year 3,5, 7 and 9. Just as useless! And they place school results on line, so parents can decide that this or that school is no good. So, of course, you teach to the test. And then they complain that you teach to the test. Which is the same for kids born in Australia and those who barely know the language. It’s not, in theory, compulsory for parents to allow their children to sit the tests, so some don’t, if they think their children won’t get anything out of it. And then schools are blamed for discouraging children from sitting it. Needless to say, the test IS compulsory for the school. I would be very surprised to hear that your test devisors had children in the state system. The people in charge are those with money - and class consciousness. Good to know that things are just as bad in Australia, Sue! Not. I always loathed these kinds of 'comprehension' tests. I was a bright, very bookish, very literate child, consistently ahead of my class in reading skills. But could I answer one of these tests correctly? Could I *%£*! Many times, when given the 'correct' answer, I read back through the set passage and tried to work out how on earth the correct answer could possibly be the answer to the question. My own answer was supposed to show that I comprehended the passage, wasn't it? - I comprehended it. Many times I could only conclude that the person setting the questions didn't. It's not good to find that these incomprehension exercises are still as bad and are now being inflicted on 7 year olds. I am so glad to see such this sensible analysis of a test that, as far as a child's schooling goes, is considered highly important. Parents will be given their child's results butI'm fairly sure most won't see the test-paper itself and so never know what a poor, dull and muddled text theirc hild faces. nor the totally confusing questions Year 2 readers have to tick. Although some parents, as teaching staff, may see the papers, they may not have time to study the paper/booklet before handing it out - or when collecting it back in for speedy marking. This is a really important post . It makes me so angry that children will feel failures if they do not pass, and yet it seems rigged so that the most thoughtful readers will fail. It is AWFUL. Like Susan Price, I always did really badly on comprehension tests for the same reasons she gives. Why haven't we improved , and how can we get across to the public that it is not the children who are failing but the system. By writing and sharing posts like this, I suppose. Thank you for writing it. It should NOT be multiple choice! That is just to make it easy to mark. The rubric for the first question should read: "How was Bryn feeling?" With many possible answers. It's so, so, so awful. I had to start my PGCE year (happily abandoned, partly due to finding out how abysmal things like this are) by teaching this awful tripe. I cringe even now for the poor kids who suffered through it. My lessons were rated highly though. Teaching drivel well = teaching well, apparently. In order to get onto the PGCE in the first place you have to do tests in literacy and numeracy (computer based, multiple choice). The literacy one was very similar to this one you posted, in quality of design and content. Not one of my cohort had a good word to say for them. The drop outs from the school-based course I was on were the most highly qualified entrants to the course, those with high expectations of education and plenty of experience of learning. Teachers nowadays are not being taught to teach but to train. "Or is it there just to trick the kids so that they answer this question wrongly?" I've done test-writing. I can tell you Dad's comment is there precisely to create a third wrong answer. And yes, it's often impossible to create three wrong answers without some terrible writing, especially at lower years/grades where you can't add too many words or complex concepts.